Michael Pollan has always seen a close connection between the life in his garden and the food on his table; in his bestselling book The Botany of Desire, he wrote about the global implications of genetically modified potatoes and also grew them in his backyard. In an earlier work, Second Nature, he wondered about the artificiality of the American garden, the moral correctness of a compost pile and the sheer weight of the season's vegetable harvest. Even now, in The Omnivore's Dilemma, his assessment of global agriculture has implications for the garden. Pollan traces the natural history of four meals: a fast-food lunch at McDonald's, an organic, farm-fresh meal eaten near the farm, a "corporate organic" meal from Whole Foods and a meal made almost entirely of food that he grew, foraged or hunted himself. Along the way, he has plenty to say about what we grow and what we eat — and he'll get you thinking about how you garden, too. If the organic baby lettuce you purchase at the grocery store was grown on an industrial farm, harvested by machines and driven across the country in a truck, does the term "organic" lose its meaning? He cites one ecologist who estimates that 57 calories of fossil fuel are burned for every calorie of baby organic lettuce produced. If the lettuce had been grown conventionally, the figure would have been only four percent higher. In other words, the cost to the environment doesn't end when the food leaves the field. Harvesting, washing, chilling, bagging and shipping the lettuce, he suggests, is all part of the food chain and should be taken into account when we use a label like "organic." So what's the answer? Pollan himself points out that it's hardly practical to put together three meals a day, every day, from food that you've grown or foraged or killed yourself, and it's not always feasible or affordable to even buy locally grown food. Besides, even if nothing else changed in the industrial food chain, eliminating synthetic fertilizers and toxic pesticides, herbicides and fungicides from agriculture would represent an enormous step forward for the environment and for the safety of farmworkers and consumers. And getting those chemicals out of the ground will not just give us safer food — it may also give us more nutritious food. A 19th-century German chemist named Baron Justus von Liebig came up with the idea that plants rely on three major nutrients: nitrogen, phosphorus and potassium. Bags of fertilizer carry the N-P-K label even today thanks to Liebig's work. Pollan calls the N-P-K approach to soil fertility "the scientific method at its reductionist worst" and describes healthy earth as a mystery that we should treat with some respect. "When we mistake what we can know for what there is to know," he writes, "a healthy appreciation of one's ignorance in the face of a mystery like soil fertility gives way to the hubris that we can treat nature as a machine." He goes on to cite studies that show that organically grown produce may be more nutritious because it contains higher levels of substances like polyphenols, which help fight cancer. Plants that are grown organically develop these compounds to fight off pests and disease, and also have access to more soil nutrients to help produce them in sufficient quantities. "Qualities we can't yet identify in soil," he writes, "may contribute qualities we've only just begun to identify in our foods and our bodies." So even corporate organic agriculture offers some advantages. Still, most gardeners who read his book will be motivated to abandon that industrial lettuce for their own homegrown variety. After all, what could be simpler to grow than lettuce? Sprinkle a row of seeds in the ground every few weeks, water and wait. There you have it: slow food at its slowest. But where did your own agricultural inputs come from? Have you been saving lettuce seeds yourself, year after year, or did you order them from a seed company on the East Coast? What about the manure you raked into the soil? Was that bagged in the Central Valley and trucked here? If there is such a thing as corporate organic agriculture, what about corporate organic gardening? 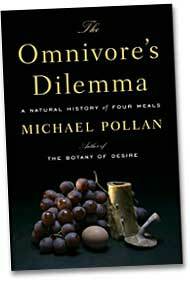 The Omnivore's Dilemma is one of those books that will get you wondering about every small action you take in the kitchen or in the garden. Just this morning, I was spreading some industrial-organic jam on some locally baked bread made with wheat that surely didn't come from Humboldt County, and waiting for my fair-trade Latin American coffee to brew, and I realized that even if I did assemble my breakfast from entirely locally grown ingredients, nothing else in my kitchen would pass the sustainability test. The toaster wasn't made locally, nor the coffee machine, nor the napkins or the mug. Out in the garden, I may not be doing much better. Those tulips in the ground come from Holland. That butterfly bush came from a local nursery, but it probably arrived by truck from some faraway greenhouse. The organic fertilizer I bought for my apple tree came from Indiana, and the ingredients that went into it — the kelp meal, the bat guano — may have come from all over the world. It's enough to make you want to abandon the enterprise all together, but I'm not giving up. My garden is a crazy little circus of imported plants, European earthworms, chickens from a Fresno hatchery and organic fertilizer from all over. It's a productive and meaningful place, filled with my best efforts and good intentions. And I think it does better without too much scrutiny, so this weekend I'm going to put down Pollan's book, turn off the computer and go outside to dig in the dirt. Send garden news to amystewart@northcoastjournal.com, or write in care of the Journal at 145 G St., Suite A, Arcata, 95521.